Tommy Nobis is considered one of the greatest linebackers in the University of Texas’ history winning the Outland and Maxwell trophies in 1965 as the best all around linebacker in the country. (What was even more amazing was that Nobis also was the offense’s starting guard as well.) A proven star against big name talent, Nobis helped the Longhorns win the 1963 Cotton Bowl for the college’s first College Football National Championship against Roger Staubach and Navy. Nobis later helped the Longhorns defeat famed quarterback Joe Namath and Alabama in 1965 in the Orange Bowl. 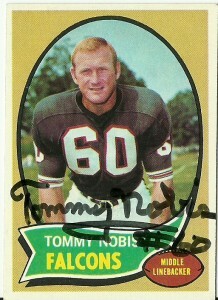 Tommy was wooed by both the NFL and the AFL after the 1965 season. In one of his more grander schemes during the AFL’s renegade days, Houston Oilers owner Bud Adams courted Nobis on board an airplane flight over Texas. Nobis was the #1 overall pick of the NFL Atlanta Falcons, and the #5 pick overall of the AFL Houston Oilers. 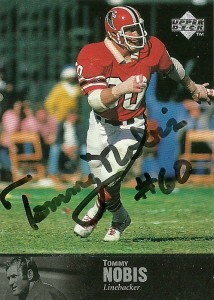 Tommy opted to sign with the Falcons, becoming their first ever draft choice and earning his nickname, “Mr. Falcon”. Nobis’ number 60 is officially retired at the University of Texas alongside Earl Campbell‘s number 20. It comes out of retirement semi-periodically when the team has had an outstanding talent at the position that they wish to honor, such as Britt Hager during the late 80s and Derrick Johnson more recently during the early 2000’s. 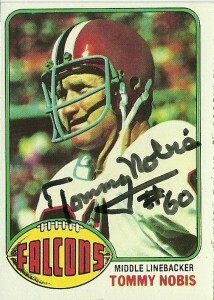 A member of the NFL All-1960s team, Tommy has also been honored by the Atlanta Falcons as well, and worked in their front office for many years. UPDATE 12/13/17- Tommy Nobis passed away today at the age of 74. No immediate cause of death was provided.